(…continued) The end of the story is what counts most, says Ecclesiastes, and the Bible is big on happy endings. The Bible is realistic about the suffering in the middle of the story, but teaches us to view the suffering in light of the end. Sometimes, as in the book of Romans, that whole process is described theologically. Many other times, as in the story of Elijah and the grieving mother, the process is described by telling stories. All of these stories are brief in the reading, but long in the living. Think of the lame man at Bethesda. He had been praying for help for 38 years before Jesus came and healed him. It is a wonderful story to read of a miraculous healing and a happy ending. But that man waited in the ‘middle of the story’ for 38 years. Are you in the middle of any trouble or sadness right now? Satan wants you to believe that you will be stuck there, and that the middle of the story will last forever. Sometimes it may seem that way; as we say, “some things never change.” But the Bible keeps opening our eyes to a larger perspective, a perspective that sees even beyond death. It does so with stories like the lame man at Bethesda, Elijah raising the widow’s son from the dead, and many more. The stories teach us that even though life is sad and messy in the middle, the end of the story can, by faith, change everything. The end of the story is what counts most, says the Bible, and sports will teach you as much. Imagine that the Minnesota Twins are behind for an entire game, but with two outs in the bottom of the ninth Brian Dozier hits a grand slam home run to win the game. How will the fans be feeling after the game? Will everyone be sad because their team was behind for so long? Of course not. Rather, the focus will be on the end, the victory; and that victory will be even sweeter because of the earlier struggle and frustration. The happy ending changes how one views the entire previous struggle. The 23rd Psalm says, “Even though I walk through the valley of the shadow of death, I will fear no evil, for thou art with me.” The Psalmist says he’s ‘walking through’– he is just passing through the bad times on his way to somewhere else. He is talking about the middle of the story, and he knows he is on his way to a better ending. Therefore, the Psalm is able to end with the happier words, “I will dwell in the house of the Lord forever.” So as Winston Churchill said, “If you are going through hell, keep going.” Or as C. S. Lewis said: “It doesn’t matter how deep the water is beneath you, as long as you keep swimming.” And God says, if by faith you keep going you will get there, and the end of the story will be good. God opens our eyes to this deeper hope and broader perspective which gives us the resources to approach, understand, and deal with all we must suffer in the middle of our stories. We can deal with suffering by looking forward to the end of it, knowing that God will not leave us stuck in the middle, nor will God just allow it all to go down the tubes at the end in death. That true story gets to the heart of what I’m trying to say. 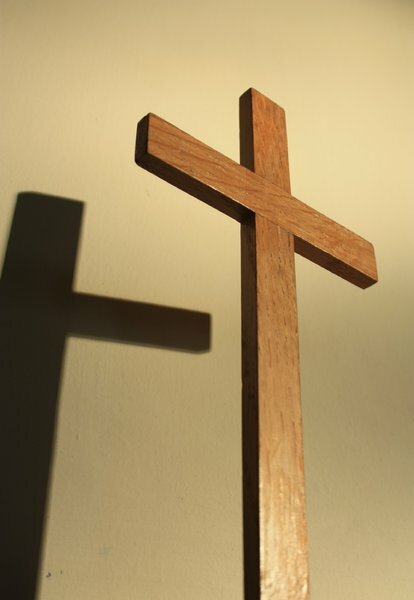 Two of Christianity’s basic symbols are the crucifix, a cross with Jesus on it, and, the empty cross. The crucifix can serve as a symbol of the middle of the story, that painful middle when Jesus was suffering on the cross and the disciples were stuck in pain and grief and confusion and hopelessness. But the empty cross speaks also of the empty tomb, symbolizing the rest of the story, when the suffering will end and new life will be given. Ecclesiastes 7:8 — Better is the end of a thing than its beginning, and the patient in spirit is better than the proud in spirit. Hebrews 6:11-12 — We want each of you to show this same diligence to the very end, so that what you hope for may be fully realized. We do not want you to become lazy, but to imitate those who through faith and patience inherit what has been promised.